This study identifies possible hotspots of climate change in South America through an examination of the spatial pattern of the Regional Climate Change Index (RCCI) over the region by the end of the twenty-first century. 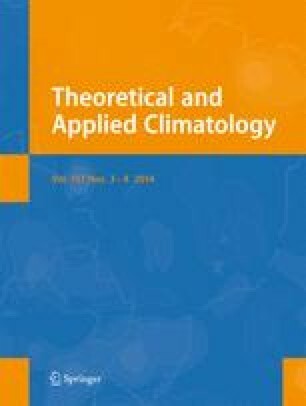 The RCCI is a qualitative index that can synthesize a large number of climate model projections, and it is suitable for identifying those regions where climate change could be more pronounced in a warmer climate. The reliability and uncertainties of the results are evaluated by using numerous state-of-the-art general circulation models (GCMs) and forcing scenarios from the Coupled Model Intercomparison Project phases 3 and 5. The results show that southern Amazonia and the central-western region and western portion of Minas Gerais state in Brazil are persistent climate change hotspots through different forcing scenarios and GCM datasets. In general, as the scenarios vary from low- to high-level forcing, the area of high values of RCCI increase and the magnitude intensify from central-western and southeast Brazil to northwest South America. In general, the climatic hotspots identified in this study are characterized by an increase of mean surface air temperature, mainly in the austral winter; by an increase of interannual temperature variability, predominantly in the austral summer; and by a change in the mean and interannual variability of precipitation during the austral winter. We are thankful to two anonymous reviewers that provided suggestions that considerably improved the quality of the manuscript. The first author was supported by the Coordenação de Aperfeiçoamento de Pessoal de Nível Superior (CAPES) and by Brazil's Conselho Nacional de Desenvolvimento Científico e Tecnológico (CNPq). Additional support was provided by the Amazonia Security Agenda Project led by CIAT and GCP and funded by the Climate and Development Knowledge Network, by the projects Rede-CLIMA, the National Institute of Science and Technology for Climate Change (INCT-CC), from the FAPESP-Assessment of Impacts and Vulnerability to Climate Change in Brazil and Strategies for Adaptation Options project (Ref. 2008/581611). We also thank the Program for Climate Model Diagnosis and Intercomparison (PCMDI) and the WCRP's Working Group on Coupled Modelling (WGCM) for making the CMIP3 and CMIP5 multi-model dataset available.